UPDATE: On 7 January 2019 Richard won the Golden Globe award for best actor in a drama for his role in Bodyguard. Channel24’s Herman Eloff spoke to the Scottish TV star, Richard Madden about his thrilling new role in the riveting British drama, Bodyguard, that has everyone hooked. Cape Town – The ruggedly handsome Sergeant David Budd is a heroic but volatile war veteran that works as a specialist protection officer for the Royalty and Specialist Branch (RasP) of London’s Metropolitan Police Service. He gets assigned to the high profile job of protecting the ambitious and powerful Home Secretary Julia Montague. But the job is much more complicated than would appear at first glance. When David has to decide between his duty and his beliefs he quickly realises that he might become the biggest threat to the very person he was meant to protect. Scottish actor Richard Madden, best known for his role as Robb Stark in the HBO television series Game of Thrones, shines in the macho role of David in this thrilling fictional story that had Brits on the edge of their seats earlier this year. 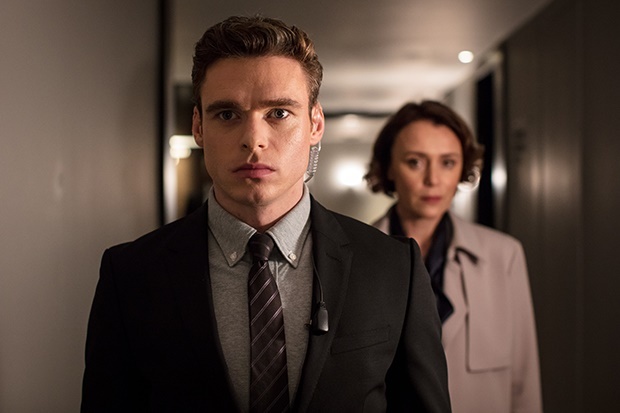 In fact the show did so well that the finale of Bodyguard was "the most-watched drama in the United Kingdom since current records began", Variety reported. Now South African audiences can finally see what all the fuss was about as the six-part series is currently available on Netflix. According to the 32-year-old star he was completely overwhelmed by the wave of positive feedback the show has received since it first aired in the United Kingdom; "You never expect it. You never really know how things are going to go down with the public. "I’ve been really overwhelmed by this response to it. I’m very proud of the show and the whole team who works on it, because we worked super-hard on it. "You know it’s easy for a show to air and then people critique it without appreciating how much hard work actually went into it. So when the show is going down so well with the audience it’s really a good pay-off for how much work went into it." The massive success of the show in Britain quickly piqued the interest of streaming giant Netflix who picked it up for its global audience. With international reviews already streaming in, it’s clear that Sergeant David’s adrenaline pumping job is elevating the heart rates of everyone watching – a thrilling thought for the humble star behind the red-blooded character. "I’m really excited for the show to reach a global audience," Richard says. He adds; "I’m really proud of what British drama is doing at the moment. I think it’s brilliant that we have a great platform (Netflix) to put the show across to a larger audience. There’s some really great talent here (Britain) – from writing, to make-up, just really great talent in the country. I’m glad the world gets to see that." In Game of Thrones, Richard portrays the stoic heir to House Stark, Robb Stark, often referred to as the Young Wolf. It’s those same imperturbable qualities and brooding personality traits that he brings to this modern tale of good versus evil. For Richard the decision to take on the role was precisely because of the complexity that lurks within the protagonist; "I’ve not read a character like this before. A man that was so many things at once. Someone who is such an unacknowledged victim and yet also such a hero at the same time. "He was just someone who was really fascinating for me. No character in the show is completely black-and-white in their morals, including David, and I loved exploring that grey zone. I think that’s what makes it such a brilliant drama." As with his previous roles, Bodyguard challenged Richard mentally and physically and also demanded long hours of hard work; "The show is definitely not a comedy, as you know, so it’s a very draining role. To be doing that 14 hours a day, 6 days a week for 5 months is challenging. It takes its toll on you because you carry that with you all the time. "Physically it was also difficult just because of the nature of what we were doing. There was also a lot of shooting outside in freezing temperatures in London wearing just a shirt and a bomber (jacket). That takes it out of you as well," he laughs. But perhaps his greatest challenge was giving life and warmth to a character with an ironclad exterior, says Richard. The role of Sergeant David demands a calm external demeanour whilst a storm of emotions rage within; "It’s difficult to connect with the audience, and let the audience see what’s going on in David’s head when the whole nature of his character is that he shows very, very little. Because that’s the nature of his job. He can’t give anything away. "We hopefully achieved that with how we shot it and that’s what makes it exciting. We’d shoot a scene and then at the end of finishing shooting we’d put the camera right in my face and shoot it again. Doing the whole scene just from my point of view. So we got to see how the world sees it and then through David’s eyes. I think that’s how we managed to kind of approach that very difficult aspect." To prepare for his role, Richard worked with experts to ensure an authentic portrayal of the character; "We had some amazing advisers on set including cohesion army advisers, and men who had actually been on the job of looking after foreign dignitaries and members of parliament. "They taught me very interesting things. Subtle things like how you would get in-and-out of a car for example. There’s different protocols and subtle things that the ordinary person won’t know. Stuff like how to hold a gun, how to sweep a room, or to ascend a staircase quickly with a large gun while looking out for danger. Those things don’t come naturally. It’s something you have to learn. "It’s little things like when the car approaches a stop you have to pop the door before it gets there so that your feet are on the ground as it grinds to a halt. It’s a smooth transition that you wouldn’t normally notice. That’s what gives it an authenticity and weight to it. I had some great people teaching me." Another element that adds realism to the story is the chemistry between David and Julia - played by the talented Keeley Hawes. According to Richard the friendship bond between him and his co-star helped him through the long days on set and was undoubtedly a highlight of working on the show; "It was great working with Keeley because she’s a phenomenal actress. It’s a very serious show and there isn’t a lot of laughs in it. Luckily I had Keeley there as a great friend during this. TV junkies can get their binge on right now and devour all six exhilarating episodes in one serving or choose to savour the taste and stretch out the suspense one episode at a time. Bodyguard is available on Netflix now.